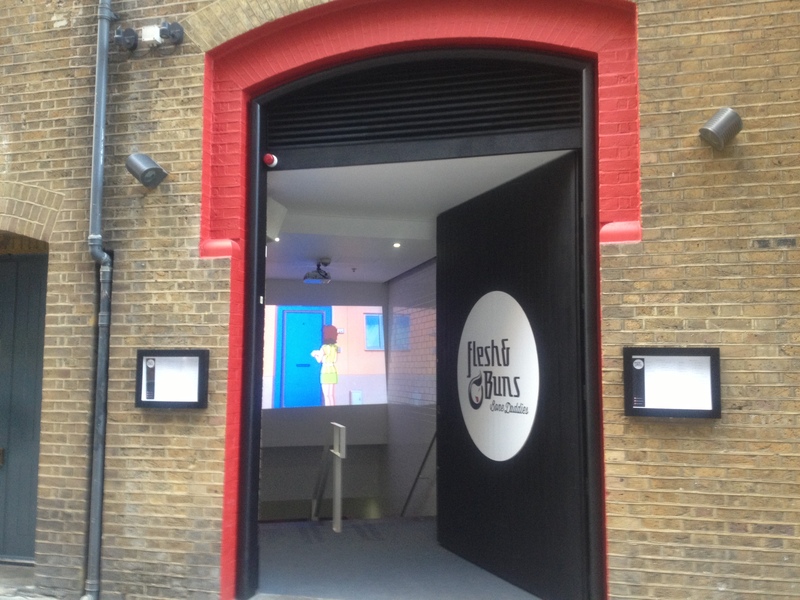 Flesh and Buns is a new Japanese restaurant in Covent Garden and is the creation of Ross Shonan who also owns Bone Daddies ramen bar in Soho. It’s based on the Japanese Izakayas (I’ve never heard of them either) which are bars that serve food to accompany the drinks – which are really popular in Japan apparently. 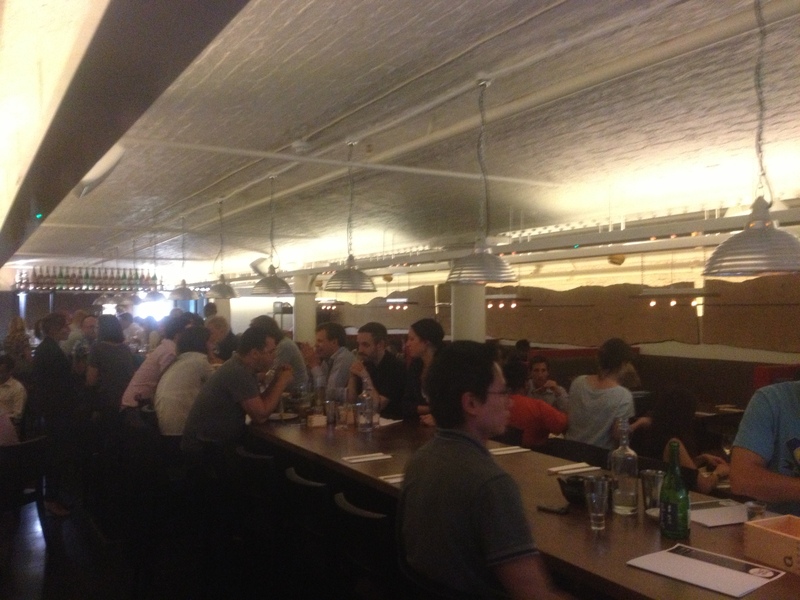 It was a fairly large restaurant situated in a basement next to the Donmar Warehouse. We were seated at the long (and I mean long) bench table down the centre of the room and it was quite a tight squeeze. The atmosphere was loud and buzzy but perhaps a little too noisy; we had to shout to hear each other. God I’m getting old! 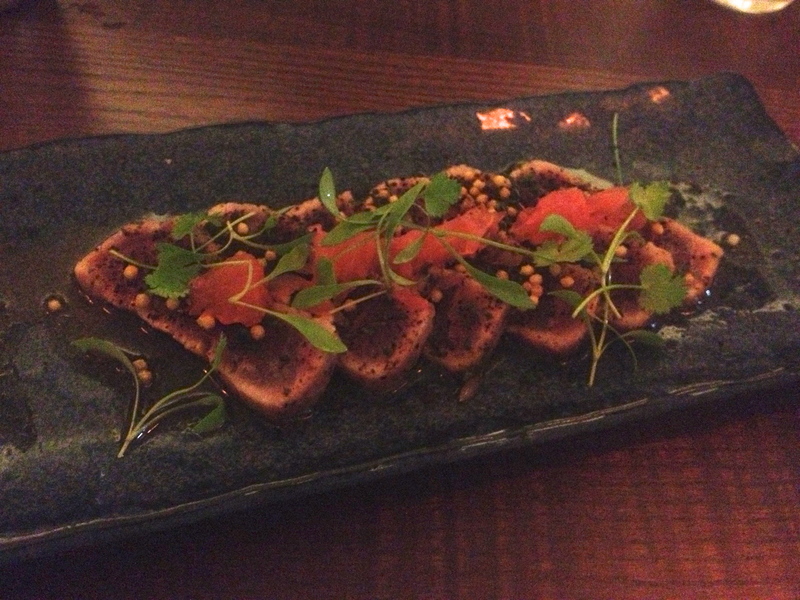 We kicked things off with some tuna tataki topped with grapefruit, chilli and coriander (£10). The thick slices of lightly seared tuna were delicious but a little overpowered by the bitter grapefruit. 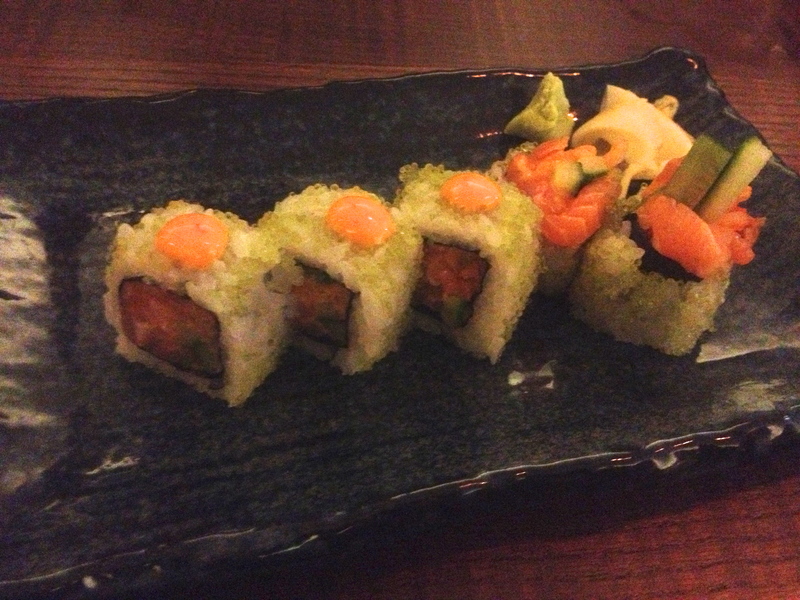 The salmon kimchi roll with cucumber and tobiko (£6.50) looked beautiful and tasted divine. The sushi was perfectly made; so light and delicate. It tasted even better with a little smear of the eye watering wasabi served alongside. 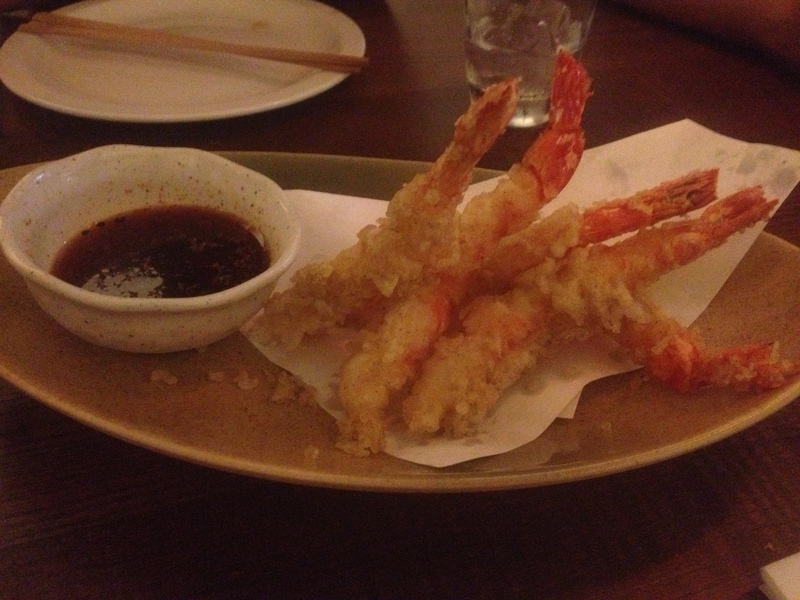 The prawn tempura (£11) were perfect; fat, juicy prawns in a light and crisp batter with not the merest hint of sogginess. 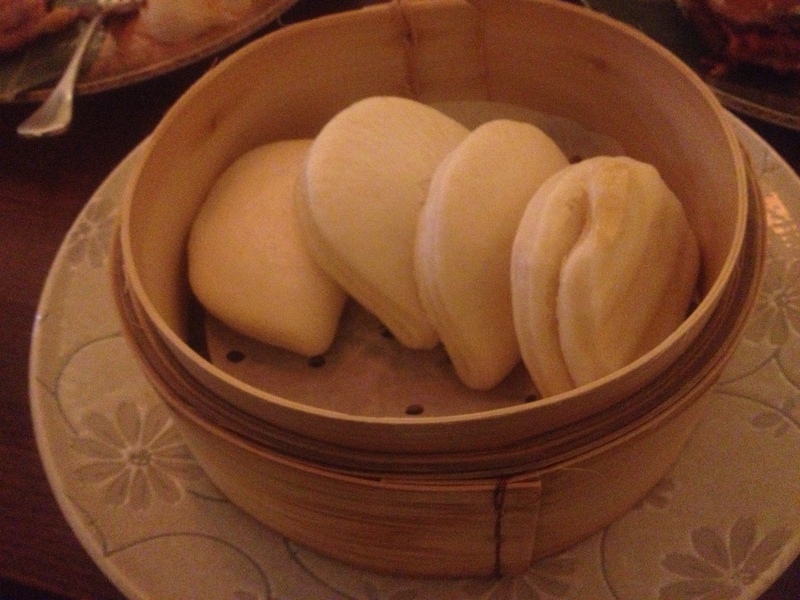 Now onto the hirata buns – this was my first time trying them and they were really tasty; steamed doughy pillows of loveliness which begged to be filled with “flesh”. 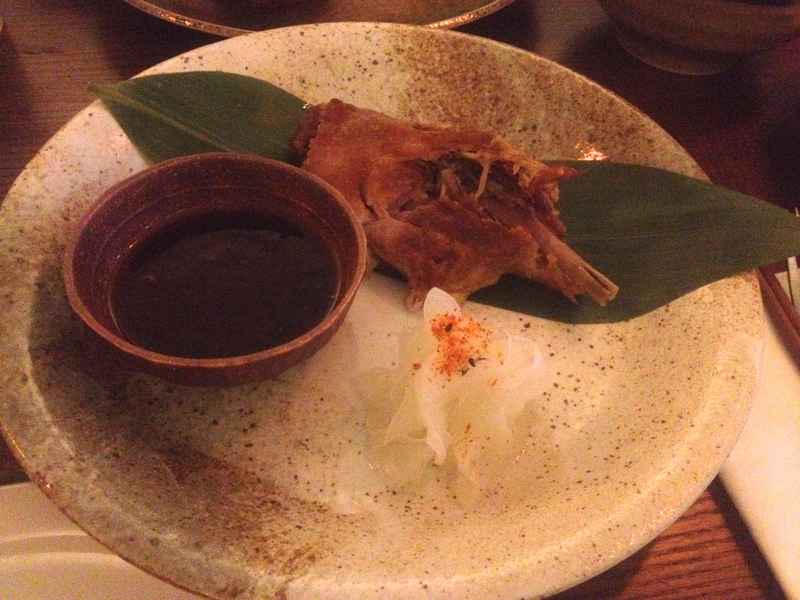 We went for the crispy duck leg (£14) which was cooked perfectly; crispy skin and soft succulent meat. Some thin strips of cucumber cut through the rich meat perfectly. For 14 quid though I had hoped for a slightly larger leg. Size was not an issue however with the great big slab of braised pork belly (£14). Covered in a layer of soft squishy fat, the meat was gorgeously tender. 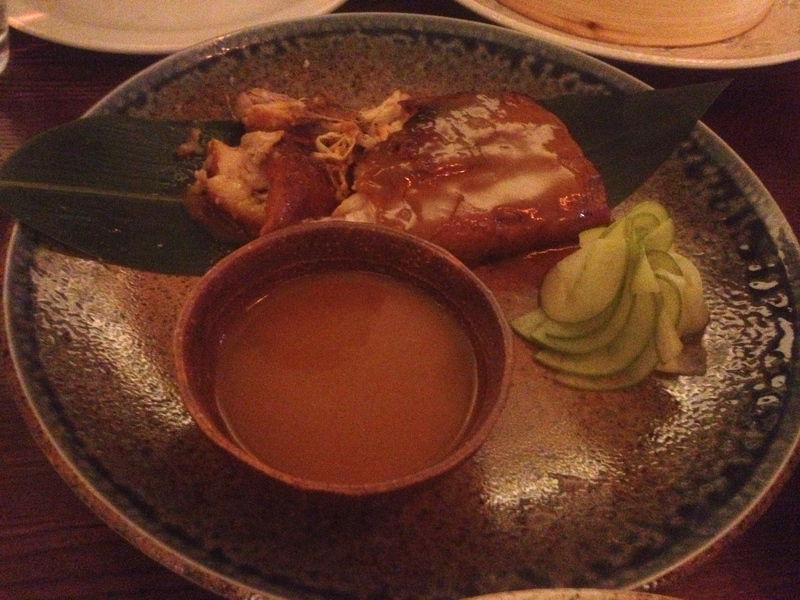 It was accompanied by a mustard miso sauce which quite literally brought tears to my eyes…and nose. Filling the buns with thin slices of apple and shed loads of the pork was a truly satisfying experience! 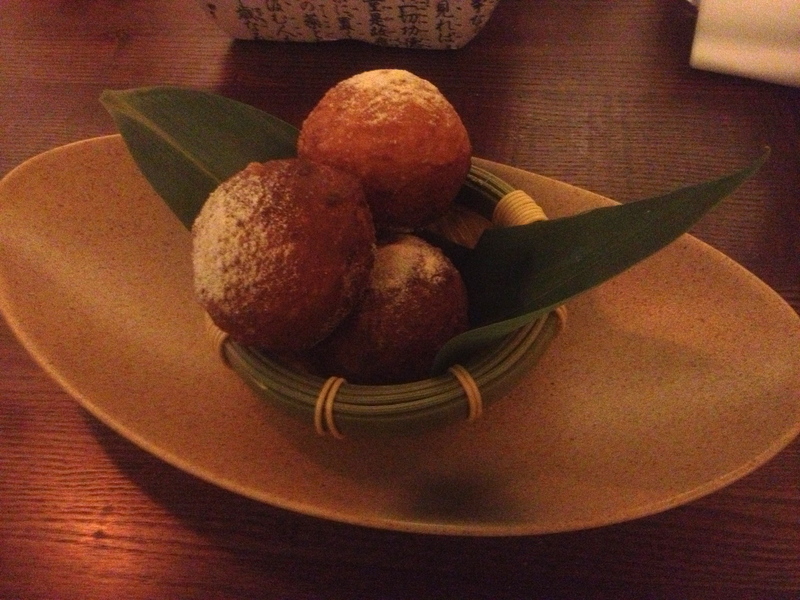 For pud, the kinako donuts (£6) were a little disappointing. Three large round donuts filled with a black sugar custard looked enticing but sadly lacked flavour and sweetness which was surprising as they had been dusted in sugar. 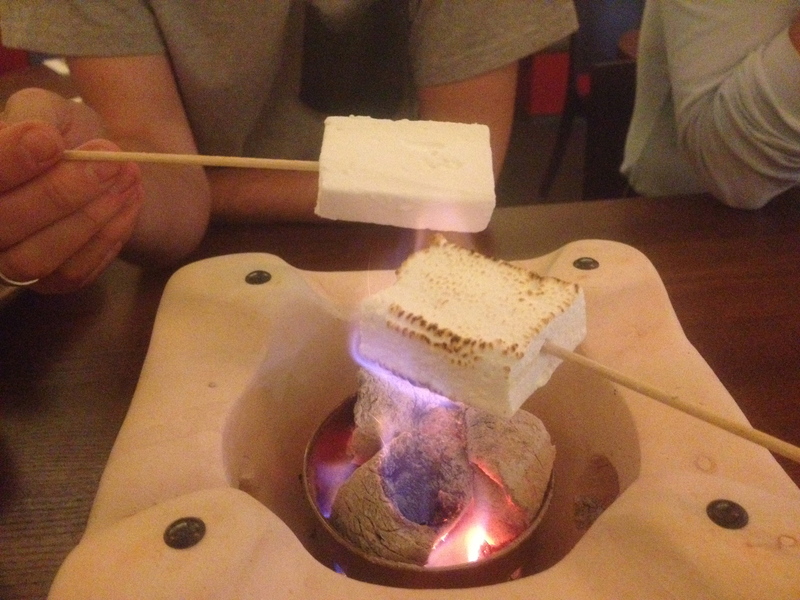 Luckily the DIY s’more (£8) totally stole the show. 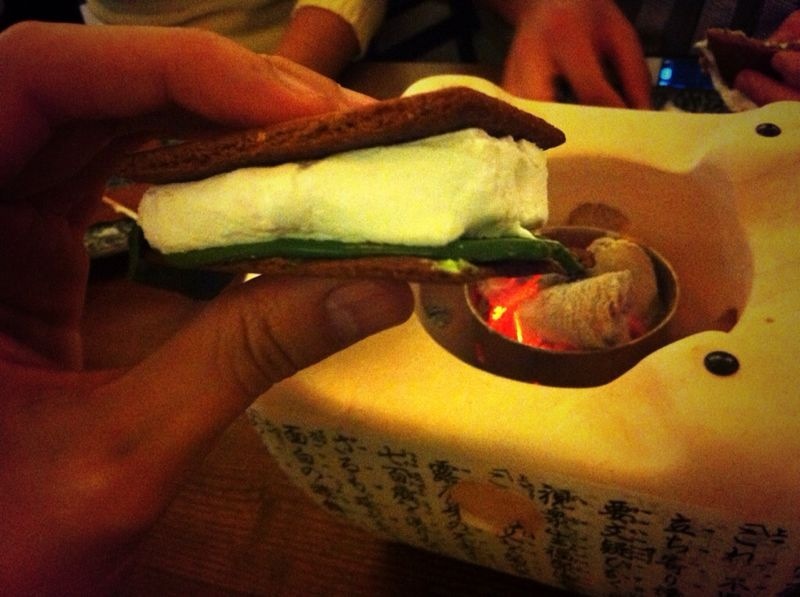 It was based on the American campfire treat where you toast a marshmallow and sandwich it between two Graham’s Crackers covered with chocolate. The nice touch here was that your very own campfire was brought to your table so you could toast the marshmallows yourself! It was quite a spectacle and a lot of fun – even if you do end up burning them like I did! 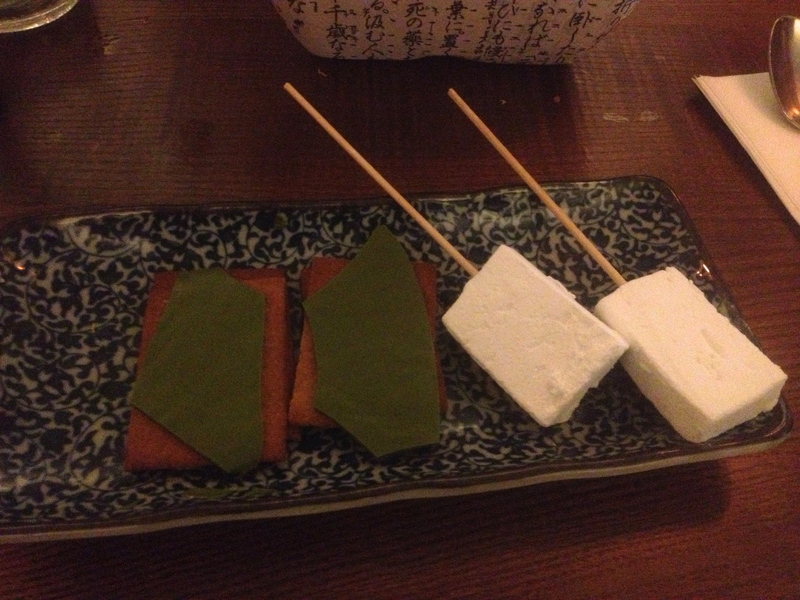 The chocolate on the biscuits was flavoured with green tea which was most intriguing but highly enjoyable. It certainly was a sweet pudding but totally worth the diabetes risk! 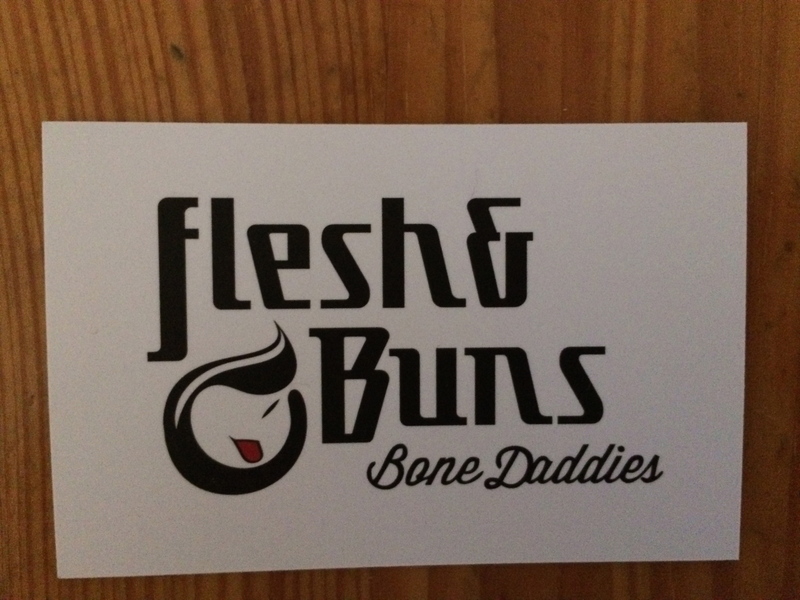 We visited Flesh and Buns on their first ever dinner service and the usual teething problems were happily overlooked as there was 50% off the food. It would be easy though to rack up a rather large bill if you go with an empty stomach and take advantage of the exciting looking cocktails and sake. But we loved the place – it looks like Covent Garden has got itself another lovely restaurant.